Ideel til både elskere af eventyr og kultur, er denne 8-timers tur til Coba arkæologiske stedet både berigende og fleksibel. Ved siden af ​​din ekspertguide vil du udforske det antikke arkæologiske område Coba på en cykel for at dække mere jord på mindre tid. Derefter vælger du enten at lave keramik og skabe kulinariske klassikere i en maya-landsby eller øge dine adrenalinniveauer med en zipline-tur og cenote-svømmetur. Middag og hotel afhentning og drop-off i Playa del Carmen er inkluderet - opgradering til en overbærende hummer middag og en maya show. Start din tur med eftermiddag pickup på dit hotel i Playa del Carmen og begynd en kort og naturskøn tur til Coba, et gammelt maya arkæologisk område omgivet af tæt jungle. Ved ankomsten til stedet vil du klatre op på en cykel og cykle forbi smukke laguner og templer indhyllet i legender, der går tilbage til maya-arven. Efter din guidede tur beslutter du, om du skal dykke ind i mayakulturen eller tilfredsstille din appetit til eventyr. Hvis du vælger den tidligere, skal du besøge en maya-landsby for at lave keramik og klassiske mexicanske retter som tortillas. De, der har valgt til eventyr, vil opleve en spændende zipline tur efterfulgt af en svømmetur i en cenote. Reconvene med resten af ​​din gruppe efter dine aktiviteter og nyd en buffet frokost inspireret af mexicanske specialiteter. Hvis du har opgraderet, nyder du frisk hummer og en række lækre akkompagnementer, mens du ser et Maya-show. Din tur afsluttes med drop-off på dit hotel i Playa del Carmen. 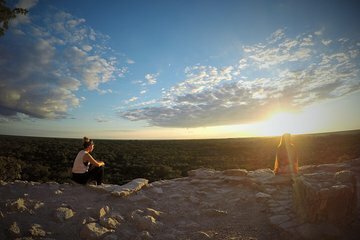 We loved seeing Coba and being able to climb the temple. We also enjoyed the biking part. Be aware that if you can't ride a bicycle then you can pay a little extra and ride on a trike that is pedaled for you and can seat two people at the front. My daughter and I did this because she forgot how to ride a bicycle. That ended up being our favorite part of the day. We had a blast. The man who pedaled the trike told us about the ruins and the breeze felt great. We loved that our tour guide was a Mayan who lived near the ruins. He was very knowledgeable and spoke Mayan, Spanish, and English very well. The transport was in a nice air-conditioned van/bus and the tour guide told us about the Coba ruins and the Mayan culture. This made the trip enjoyable. We chose the cultural experience, and I am on the fence about whether that was the best option. We knew we did not want to zipline, but the cenote sounded wonderful. The Mayan village was interesting, but the pottery making was not fun. We were given only a pingpong sized amount of clay, and were very hurried. Another group came in as we were finishing. Our guide did point out plants used for medicinal purposes, which was interesting. The head of the family whose home we visited showed us his Mayan bee hives which were also very interesting. A lady prepared hand made tortillas with pumpkin seed spread and they tasted great. All in all the cultural excursion portion of the tour was just ok. The dinner and show were great, very interesting and entertaining. We had ordered the lobster upgrade which was delicious but there was a delay in getting the lobster and we weren't told that it would be a big plate of food. If we had known that then we would not have gotten food from the buffet. We ended up looking like gluttons with two plates of food each. Be sure to take plenty of cash and some small bills because there are many opportunities to tip trike driver, cultural tour guide, family whose home was open to us, performers at the dinner show, driver, and main tour guide. There are also excellent shopping opportunities in the Mayan home and in the Mayan shops next to the dinner venue. Also, I'm not sure why this is called a sunset tour because you don't see the sunset at the ruins. The sun sat while we were at the dinner venue. All in all I am glad that we went. It was a really good excursion. I might have rated it a 5 had we chosen the extreme experience. This was a wonderful tour! Between the ruins, biking, zip lining and dinner with a show we couldn't have been more pleased! I loved this tour. It was a small group only 10 of us and that made it much more personal than some of the larger tours I took on my trip. Jesus was a great tour guide. He works incredibly hard to ensure everyone has an enjoyable trip. Luis drove the van and safely got us to and from Coba. It's hard to pick one favorite moment from the trip. Climbing the ruins, biking through the jungle, ziplining over a lake that had crocodiles in it, and visiting a Mayan village were all experiences that I'll never forget. The dinner and the show were a huge bonus. The food was great especially the pork. I highly recommend this tour! This experience was great! Had a couple of issues with the wrong dinner option but other than that the tour was great.